Surveys, surveys, surveys — wow, do I get sent a lot of research and surveys. That’s not necessarily a bad thing because surveys provide a snapshot in time and a marker that we can use to measure how things are, how they may have changed, and, where they might be going in the future. Yes, it’s a little peek into how things are — even if we don’t always like what we see. AMA Enterprise, which says it “provides organizations with advisory services as well as tailored learning programs,” surveyed nearly 300 senior managers, executives and employees and found that in the U.S. workplace there is a widespread sense of being left out of the loop. To paint these findings in the best possible light, some 64 percent (nearly two out of three) of those surveyed know what’s going on in their organization some or most of the time. In some of the places I’ve worked, that would be a pretty good number. But looking at this another way, more than a third of those surveyed — 36 percent — “hardly ever” knows what is going on in the business, and that to me isn’t a ringing endorsement of a particularly strong, motivated, and engaged workforce. Do you know what the business strategy is? The analysis of this research by AMA seemed to lean the same way. The survey also found that those in management sometimes feel out-of-the-loop as well, although not nearly to the extent as the broader workforce. Some 58 percent of managers said they believe they know what is going on at least some of the time. This is another side to the never-ending discussion on engagement, and of course, some people (like me) will read the findings as yet another indicator reflecting how distant and removed far too many managers are from their workforce — and shows how much needs to be done to get our national workforce firing on all cylinders and moving ahead again. AMA says that “the survey population consisted of 289 senior-level business, human resources, management professionals and employee contacts drawn from the AMA database of contacts,” and I wish I could link to the survey or press release about it here. I can’t, however, because AMA curiously doesn’t seem to have it on their website. In fact, the latest press release that pops up when you go there is from — get ready for it — 2009. Huh? The American Management Association hasn’t updated its press releases since 2009? Guess they really do know what it means to be out of the loop. But there’s more than how some employees don’t know what’s going on in this week. Here are some HR and workplace-related items you may have missed. This is TLNT’s weekly round-up of news, trends, and insights from the world of talent management. I do it so you don’t have to. 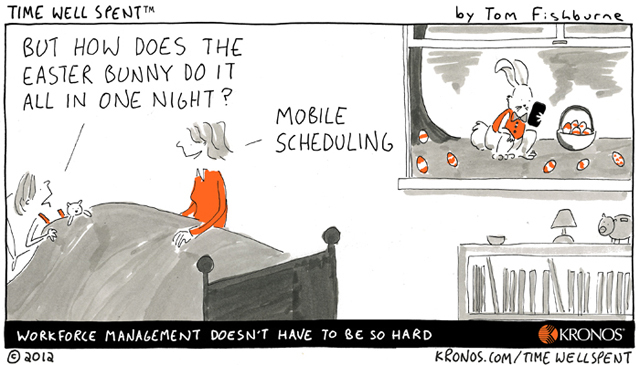 Kronos Time Well Spent Easter cartoon. Kronos, the company that probably makes your organization’s time-and-attendance systems, publishes a regular Time Well Spent workplace cartoon by Tom Fishburne. This one seemed particularly apt for TLNT, and I’ll post them here in the Weekly Wrap from time to time.